There's a Boat That's Leaving Soon for N.Y.
Art of Life Records offers three options for purchasing digital downloads of our recordings via our web site. You can purchase WAV or FLAC digital download audio files encoded at 44.1kHz/16-bit (CD Quality) or MP3 digital downloads via the iTunes Widget below. To purchase WAV or FLAC digital downloads of this album using PayPal, please click the "Add To Cart" button below. After your order has been placed you will receive an email with a download link which you can then use to download your purchase. Please specify WAV or FLAC audio file format at the time of placing your order. 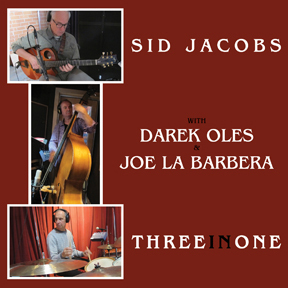 Art of Life Records is pleased to present guitarist Sid Jacobs’ new trio album, “Three in One”, featuring Joe La Barbera (Bill Evans, Joe Farrell, Chuck Mangione) on drums and Darek Oles (Peter Erskine, Brad Mehldau, Alan Pasqua) on acoustic bass. The album features many well-known Jazz Standards from composers George & Ira Gershwin and DuBose & Dorothy Heyward: “There’s a Boat That’s Leaving Soon for New York”, “It Ain’t Necessarily So”, “I Loves You Porgy”, “Summertime”, “Bess You is my Woman Now” and “My Man’s Gone Now” in addition to Wayne Shorter’s-“Infant Eyes” and Classical guitarist Vincenzo Macaluso’s-“Song for Rayanne”. Sid also pays tribute to his long-time friend and teacher, the late guitarist Jimmy Wyble, on the songs “Three in One”, “Scott Joplin” and “Improvisation/Etude 20” which were composed by Jimmy Wyble. All songs arranged by Sid Jacobs. Recorded by Sergio Ruelas on June 3rd & 4th, July 22nd & 23rd, 2017 at Apogee Studio in Santa Monica, California. Mixed by Adam Munoz and Phil Lewis at Fantasy Studios in Berkeley, California. Mastered by Michael Romanowski at Coast Mastering in Berkeley, California. Produced by Phil Lewis for the Maginus Project. Executive Producer: Paul G. Kohler for Art of Life Records.